orpheoet wrote: A simple easy to navigate site with upcoming events and information relevant to new shooters would be a great start in my opinion. I can remember starting at a local club who did 3 gun NMC events at 15 and 25 yards..we had quite a few police officers in those days who shot.. lots of different firearms and not too many were true BE pistols.. my whole family shot at those matches.. My wife and I were the only ones who ventured into true BE matches.. I shoot BE in 4 different leagues during the year. Every year the number of participants gets smaller except at one club. They opened it up to two handed shooters and now have more 2 handed shooters shooting BE than one handed. Lots of women and teenagers trying out the sport as well as the old guys that shake too much to shoot one handed any more with some action guys trying to develop some trigger control. They are all smiles when at the line and it has been a big boost to this club. They have their own group that they compete against so at the end of the season they have both 1 and 2 handed winners. Just something to think about for the future of the sport. Two handed shooting is a fine option for local leagues. Encourage your league shooters to ride along with you to your next registered or approved 1 handed match and give them the itch to move beyond the leagues. 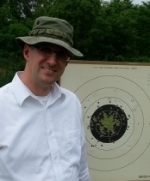 Wisconsin Bullseye shooting is growing. We are starting to get full matches that fill up weeks in advance. We are even adding more matches and getting good turn outs. All we do is collect email addresses of shooters and offer carpool to matches. We can grow our ranks by doing this across the country. How old are the new shooters in WI? We are starting to see some people come back to Bullseye after not competing for a few years (the lure of the 22 Distinguished badge may be part of it). But at a recent match, I was the second youngest person on the line and I am 51. Rob Kovach wrote: Two handed shooting is a fine option for local leagues. Encourage your league shooters to ride along with you to your next registered or approved 1 handed match and give them the itch to move beyond the leagues. Enthusiasm will help interest. Encourage shooters of all ages & levels of both skill & equipment to join your practices. Talk up the matches and the guns used, with an emphasis on the cheaper stuff so as not to let high $$ scare them off. Once they're hooked, the nicer/better guns etc sell themselves. Those that already have target pistol(s) should be persuaded the BE game is a chance to use them. Thanks Ron! Hang in there and shoot as much .22 as you can. In the new match we hosted in June, I think we had over 20 juniors. I wholly reject the worry that bullseye shooters are getting too old. There are 300 million people in this country, and many of them are handgun owners. It really doesn't matter what age they are as long as they have fun. Rob Kovach wrote: Thanks Ron! Hang in there and shoot as much .22 as you can. That's great, 2 juniors would make me happy. We should take the positive view, this is just a cycle. It looks as if NRA & CMP are takin off in every direction at once w/ production classes, all .22 matches, and the if some officer in Podunktu in 1952 carried it, it can be used in EIC. If anything should be resistant to change it should be the 30 shot NTI and the leg matches shot around the country!! Make the matches/practices fun. Include the new guys in it. Shooters want to be part of a group that enjoys themselves.